Interactive Card: Dr. Ph. Martin’s Rainbow Ride! I hope you guys are ready to take a little ride on an interactive card today! There’s LOTS more info in the post than there is in the video, since I made it quite a while ago – so be sure to read through! The little seated characters in the Tandem Ride set (there’s THIS one with a bike as well as the one I used HERE) inspired today’s card…I love foxes and ended up only getting the “additions” set with no bike – so I made a ride for my fox! I knew I had a rainbow die in my stash, and just needed to rig up the interactive part. Watch the video below or click HERE to see it in HD on YouTube! I filmed this video when I only had set 3. I loved the intensity of colors so much that I had to get the other two sets as well…I think I’ve developed a bad case of Full Set Syndrome, a term coined by Lydia! If you want to try just one set, I think set 1 has the most “standard” variety, and set 3 has the pretty jewel tones….it’s so hard to pick that I decided I needed all three. I haven’t found a container that’s suitable for my 1oz bottles, but I did figure out a cool way to store them. I picked up a strip of crown moulding at my local Lowes – I screwed it into the studs along the wall above my desk, and voilá, a shelf! The moulding is 1-1/4 and the bottles are 1-5/8, so they hang over just slightly – enough to grab and go easily. 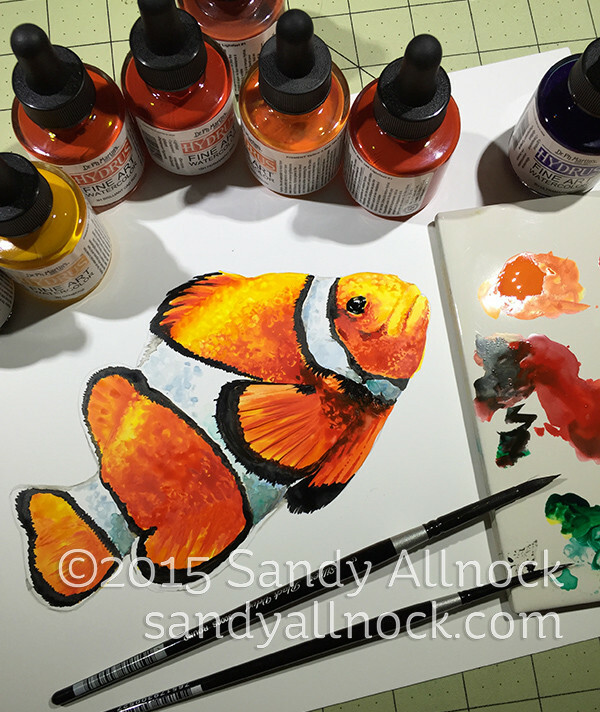 On Periscope the other day, I attempted a painting of Nemo (below) with the Ph Martins on Yupo paper – and what fun! It’s not easy on Yupo, I’ll warn you – but you can see the beginning of this painting HERE until this weekend. 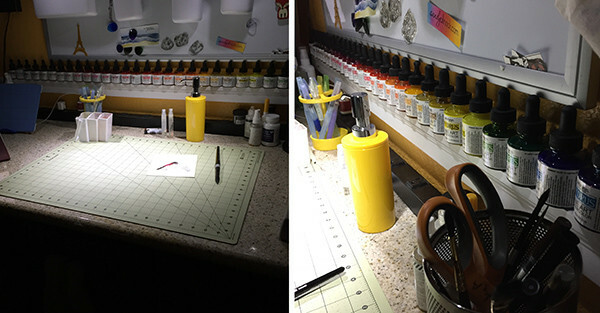 If you’re available, I hope you’ll come join me for Open Studio on Periscope! I’ll be watercoloring all day, and I’ll have the camera on the whole time, technology-willing. Rather than watching a many-hour replay, you might like to stop in and visit a few times during the day and say hello. Tomorrow on the blog, I’ll have a list of supplies I’m planning to use, and a link to get to the broadcast, etc. Just wanted you to mark your calendars so you remember to pop in. See you then! My adaptation of the rainbow card has Goku from Dragonball Z riding on a yellow cloud called Nimbus, sliding on the rainbow. I made it for my son’s 32nd birthday. I’ll have to wait for the weekend to give it to him, but I shared a picture of it with his wife, and she loves it! I would love to share it with you. Thank you for making easy to follow instructional videos. I’m learning so much from you! That rainbow card is awesome…so cute. I just smiled all the way through that video. And I love the cards you made with the leftover paint, especially the first one. Very cute card. I love cards with critters. 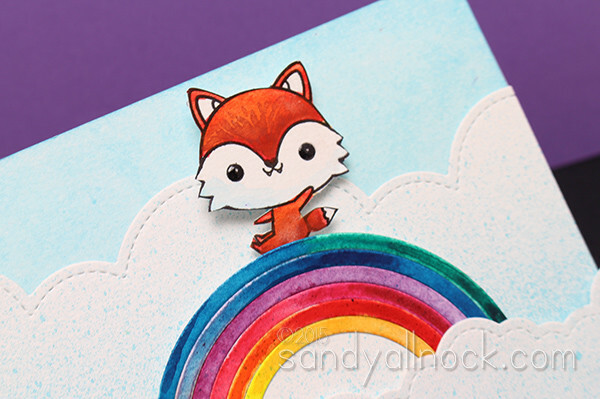 Really sweet card – I love foxes too! And from the “Why didn’t I think of that? Department” – that’s a super tip for die-cutting rainbows so they’ll stay together – no more fighting with teeny pieces of rainbows! THANKYOU! Oh my goodness Sandy, THAT is ADORABLE! How sweet is THAT??? Good work, my dear! What fun you always provide. The clown fish turned out great! I watched the start of it on Katch. Thanks for starting my day with a happy note! 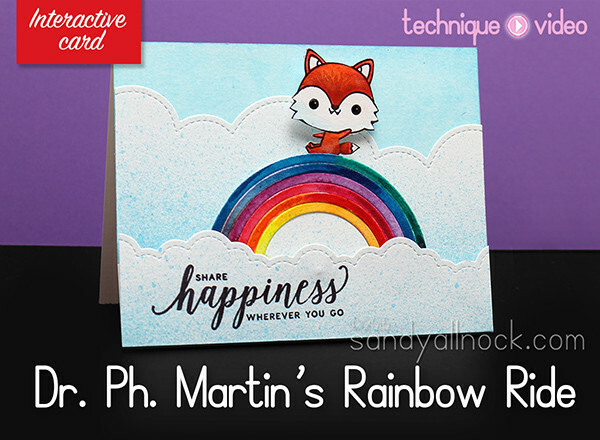 Love your interactive card as well as the additional cards you made with the “extra” paint…just beautiful!